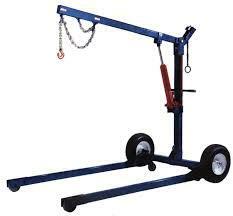 Towable Engine Hoist. Requires 2" ball hitch. Maximum "Tip of Boom" height: 100". Comes with 5' chain with slip hook. 53" wide x 76" long.